Whilst you pay for the entire product, not all part of the product are usable/edible. You should enter the yield for SKUs which has yield loss, like vegetables, fruits and meat. If the amount of trim and waste rises, so do food costs. Therefore entering the yields, will help you get more accurate food cost. Yielded cost of the SKU will be used in recipes. Go to SETTINGS -> SKU Yield to enter the yield. Click ADD YIELD button to add the yield. As shown in above example, the actual yield of "Chicken" after the removal of wastage is entered. You can also add yield entries for SKU&apos;s from SKU list page. Go to INVENTORY -> SKU page to edit. As shown below, you have to just click on the number below the Yield column/label and you’ll be able to change it to any number. 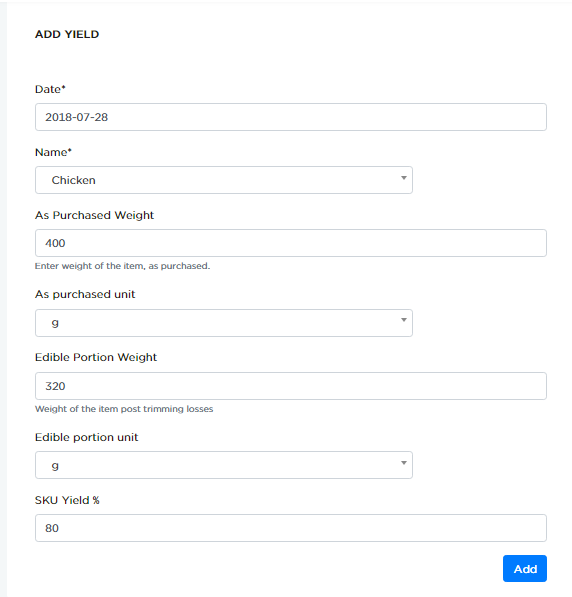 Changes made this way automatically gets added to SKU Yield list page. You can use edit icon to change existing yield entry for any SKU. Note: By the default the yield is considered as 100% for all the SKUs and this can be changed using above methods. You can delete the entered yields using delete icon. Filters button is used to list the yields based on date range. 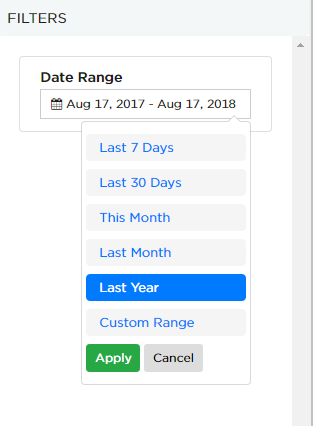 Select the date range and click Apply button to see the yield entries. Click Cancel button to cancel the option. You have an option to select multiple yields and delete them. Click Date label&apos;s checkbox to select all the yields present in that page. Click Delete to delete the yield permanently.